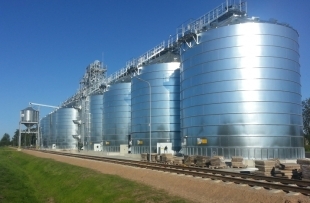 The Lithuanian-owned Latvian company Linas Agro Graudu Centrs has registered a new commercial pledge to secure claims under a loan agreement with SEB Banka to build two new grain elevators in Latvia, reports LETA. The company's board member, Petras Kuras, said the new grain elevators with capacity of some 20,000 tons were to be built by the beginning of the new grain harvesting season this year. One of the new elevators will be built in Grobina, western Latvia, and the other in Rezekne, in eastern Latvia. He said currently the company had only one grain elevator in eastern Latvia - in Jekabpils in south-eastern part of the country but all other elevators operated in other Latvian regions. The maximum amount of claims secured by the commercial pledge registered on March 14 is EUR 9.3 million. The loan agreement between Linas Agro Graudu Centrs and SEB Banka was signed in February 26. According to Firmas.lv business information website, Linas Agro Graudu Centrs was founded in 2013 and is fully owned by the Lithuanian-registered company Linas Agro Grudo Centras KUB which is part of the Lithuanian agricultural holding Linas Agro Group. Linas Agro Graudu Centrs posted a loss of EUR 54,000 on a turnover of EUR 572,000 in the financial year from July 1, 2016, to June 30, 2017.